Summary: How might teachers pursue and support personally and professionally worthwhile writing practices in the midst of the many demands associated with teaching? How might writing groups sustain their work together – in person or online? 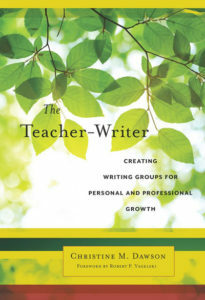 This final chapter from The Teacher-Writer: Creating Writing Groups for Personal and Professional Growth, a book that documents the first year of a successful teacher writing group, includes strategies developed and a generative framework grounded in lessons learned by the group as they met face-to-face and worked online. Their story and what they learned together will be of particular interest to teachers who wonder how to build on their commitments to personal writing and sustain a collegial community that forms in the process of writing and sharing. Much of the literature on teachers as writers tends to emphasize our teacher roles, often depicting writing in service to our students and profession, either on the local classroom level or the larger educational landscape. The explicit intention of much of this literature is to encourage teachers’ writing for just these reasons, recognizing that when we write we are better able to shape instruction from the inside, as a fellow writer in the classroom. Yet these are just some of the benefits that teacher-writers can experience. The examples in this book show us, as teacher-writers, creating space for writing, finding inspiration amid our everyday lives, nurturing ideas in our heads and on paper, and building cohesion across our writing lives. This final chapter looks across the preceding chapters, in an effort to synthesize strategies and outcomes, as well as begin to look beyond this first year in a writing group. We formed our group based on our interests and goals, and we adapted our choices based on our unfolding experiences. My hope is that you, as a teacher interested in writing, may adapt and combine strategies from across this book to fit your own needs and priorities. The goal is not to reproduce our writing group in other contexts, which may not honor the individuality of our writing group members or of other teacher-writers. Rather, I hope you will feel empowered to craft your own commitments, routines, and practices, as you seek to create a supportive and generative writing community.